Homecoming week starts on Monday, October 1st and goes through Saturday, October 6th. The Pep Rally will be held on Friday, October 5th during the school day. All students are expected to attend the Pep Rally. Please talk with your son/daughter about not bringing anything that can be thrown onto the gym floor during the Pep Rally (i.e – silly string, toilet paper, streamers, etc). This can be a safety hazard and we want to make sure that everyone is safe and secure during this exciting time. 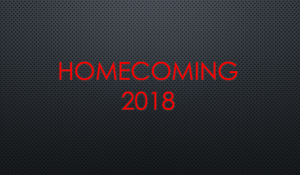 Students that bring and/or throw anything onto the gym floor will be asked to leave and will not be able to participate in any other Homecoming activities, including the Homecoming dance. King and Queen will also be announced at the Pep Rally. STUDENTS BELONGINGS WILL BE LEFT IN THE CLASSROOM DURING THE PEP RALLY. STUDENTS WILL BE EXCUSED AFTER THE PEP RALLY TO GET THEIR BELONGINGS. Don’t forget the Booster Club will be hosting its annual Southfest on Friday, October 5th ,from 4-7pm, in conjunction with the school’s Homecoming Game vs Kettle Moraine. This year’s Southfest will feature food, carnival games, inflatables, local entertainment, an Activity fair, an Alumni Welcome tent and more. The event will run before the Varsity game on the field adjacent to the Football Stadium. Admission is FREE, Food is available directly through our food truck vendors & Activity Wristbands are now available for purchase. The South community, alumni, students & families of the visiting team and the public are welcome! In the event of rain, Southfest will be held in the Fieldhouse. Fans can also enjoy fireworks after the football game! Information is on the Southfest 2018 info page! After the football game in the cafeteria we will hold the annual ice cream social until 10:30. The cost is $2.00 per person. The Homecoming football game will be held on Friday, October 5th at South’s football field starting at 7:00pm. The Blackshirts will be playing Kettle Moraine. We encourage all students and families to come and cheer on our Blackshirts. Current South students can get in free with their school ID. Tickets are $5.00 for adults, $3.00 for non-south students. The Homecoming Dance will be held at South High School from 8:00 PM – 11:00 PM on Saturday, October 6, 2018. All students should be dropped off at the Natatorium Doors or park in the student parking lot. Below is information to help make sure everyone stays safe and has a great time. GUESTS: CLICK HERE FOR FORM – DUE FRIDAY 9-28! The guest passes are due: Friday, September 28th, 2018 at 3:00 PM to Mrs. D’Angelo in the Assistant Principal’s office. NO EXCEPTIONS!!! *Guests cannot be more than one year removed from their High School graduation or older than 19 years. *All students and guests that are going to the dance must have a parent/guardian fill out a dance conduct form before they purchase tickets. Tickets will be on sale Monday, October 1st – Friday, October 5th in all 3 lunches and after school in the Athletic/Activities Office. Tickets are $12.00 for a single and $24.00 for a couple. There will be no tickets sold at the dance. If your son/daughter is not sure whether they may have one of these issues, please have them check in with Mrs. D’Angelo in the Assistant Principal’s office. *Homecoming is considered a semi-formal event. Boys are encouraged to wear a combination of dress pants, collared shirt, and tie. Girls are encouraged to wear appropriate length dresses. The school dress code does apply at all school functions. *Personal belongings (purses, cameras, jackets, electronic items, etc.) must be checked into the coat check in the cafeteria. We are not allowed to check shoes in the coat check area. This area will be monitored by staff; however the school is not responsible for these personal belongings. Students with specific medical needs will be allowed to keep appropriate personal items with them. *Do not arrive early to the dance. The doors will not open before 8:00 PM. Students who arrive early will have to wait outside. *Students who leave the dance for any reason will not be admitted back to the dance. *All students and guests must have their student ID to enter the dance. *Each dance attendee will be given a bracelet that is to be worn throughout the dance. All dance attendees must refrain from inappropriate types of dancing. Chaperones have the right to cut off the bracelet at any time. Taking off a student’s wristband is a warning. If the student needs to be addressed a second time for inappropriate behavior, they will be asked to leave and a parent will be contacted. *We will be conducting random breathalyzers at the entrance to the dance. Each student will pick from a bag of chips. If a student receives a blue chip, they will be given a breathalyzer from a Waukesha Police Department Officer. *The dance ticket price includes water and Gatorade. *Students may not go to their lockers. Except for the field house lobby, field house, and cafeteria the school will not be open. *All students and their guests must leave promptly at 11:00 PM. Please be sure to have arrangements for pick up prior to the 11:00 dismissal. Finally, a big thank you to all the teachers and support staff who will be giving up their Saturday night to make sure the students stay safe and have a great time. We appreciate your cooperation and if you have any questions or concerns, please feel free to contact one of us.